In BPO, companies that are attentive to transition issues and supporting the retained workforce can drive topline benefits from a more effective functional organization. Imagine your chagrin: You bought a sophisticated new audio system for your home, and all the electronics retailer did was deliver it, plug it in and leave. Given what you had hoped the system would provide—to say nothing of what you paid for it—you had assumed that an expert would help you set up the equipment and explain how to position the components properly for an optimal experience, how to operate the system, how to troubleshoot problems and so forth. After all, the system is meant to change the way you listen to music, and if the retailer fails to help you achieve that change, it’s unlikely you will understand the system or use even a small percentage of its overall functionality. In much the same way, today’s buyers of outsourcing services have expectations for their BPO partners and suppliers that go well beyond just setting up the function or process and meeting basic service levels. They expect the BPO relationship to deliver better overall performance and positive strategic outcomes. What are the critical components of high-performance BPO? One of the more striking findings from Accenture’s research is that the most successful BPO relationships—those that produce the greatest business value—are founded on the skills of the provider to manage the wide-ranging human and structural effects of BPO on the organization as a whole. To manage both the music system and the music, as it were. This covers a lot of territory: managing organizational change effectively both through the short-term transition to outsourcing and over the course of the longer change journey; helping people from both the retained and outsourced workforces understand the impact of the structural and performance changes caused by BPO; communicating broadly and powerfully to all affected parties; and, finally, being attentive to using change in a positive manner to improve the impacts of the BPO relationship over time. Nearly 90 percent of companies involved in a high-performance BPO relationship regard change management as an important capability; by contrast, only 62 percent of typical performers share that attitude. So what’s change management all about in a BPO context? First, it’s about managing both the short-term and long-terms effects of change. Effective BPO relationships are attentive to the organizational challenges encountered during the initial transition period and are good at optimizing the performance of both the outsourced organization and the retained workforce—that is, the employees who transition to the provider and those who remain with the client. Second, successful BPO relationships are characterized by the highly skilled management of the longer-term change effort, striving for greater business impacts over the course of the longer BPO journey and becoming more “change capable”—more adaptive and agile in the face of new business demands. The importance of a service provider with a proven methodology and with people experienced in the relevant functions and technologies was corroborated by our analysis of multiple high-performance BPO relationships. Also important were the provider’s deep and extensive knowledge of both the outsourced function and the client’s business processes. How is that process knowledge acquired? It sounds obvious, but it involves the careful and exhaustive documentation of the processes with the participation of both client and provider. The procurement manager quoted above highlighted the importance of creating in-depth descriptions of each process before kicking off the transition period, which, in the case of his company, enabled both parties to “understand clearly how operations really worked, from the requisitions to the purchase to the purchase order.” A final key to successfully managing the transition period: an “all hands on deck” approach. At a finance and accounting outsourcing engagement we studied at a global manufacturer, the pressure was on both client and provider because it was the client’s first outsourcing engagement; progress and performance were being watched very closely by top management. According to the company’s European corporate finance director, the credibility of the entire transition process depended on delivering to the pre-announced timelines; that, in turn, required the day-to-day involvement of senior managers who could make rapid decisions and bulldoze obstacles out of the way when required. Many outsourcing arrangements involve coordinating work across large geographic areas, which underscores the need for continuous, on-the-ground information about the diverse regional business needs. During the transition period at one learning BPO program we studied, an executive from the provider and one from the client traveled together around the region every six months and visited key leaders in different areas. That enabled different parts of the organization to understand the dynamic requirements of the business and then use that knowledge to help the BPO team perform better. Outsourcing demands that a great deal of attention be paid to the details of the newly outsourced function. Frequently forgotten during the transition period is part of the client organization that remains working for the company: the retained workforce and the portion of a business process remaining in-house after the outsourcing begins. Without effectively managing the changes experienced by the retained workforce, a dangerous disconnect can arise. If only the outsourced portion of the business function undergoes real change, a potentially significant source of value creation is lost from the outsourcing arrangement: the synergies of efficient transaction processing and the creativity of people better able to think beyond transactional service delivery. Our research confirmed the importance of focusing on change in both the structure and performance of the retained organization. For example, half of high performers have modified their retained organization to optimize the operating model of their BPO arrangement, compared with only 29 percent of typical performers. Three transformations of the retained organization are especially important. One of the critical organizational changes that must occur in outsourcing—critical because it is necessary to achieve better cost control—is for the “users” of business services to become educated “customers” who know how to look after the organization’s larger needs. While a user tends to consume resources with little thought to costs, an educated customer makes informed choices about service levels, functionality and costs. This shift empowers client executives to more meaningfully contribute to business objectives. Rather than responding to a “user’s” request with, “Sorry, that’s not in my budget,” the client executive works with the “customer” of the outsourcing services to weigh the business value of the request versus its cost. One high-performance BPO relationship we studied serves as an exemplar for integrating the provider into the client organization. The client executive instructed his own leadership to include the provider’s remotely located staff in everyday operations in a meaningful way, reminding his team that the provider’s offshore staff was an integral part of the end-to-end delivery group, just as the retained staff was. The client established monthly meetings with the remotely located provider employees to encourage and reward their contributions to operational innovations and improvements. In a business services organization that has been restructured to run on an outsourced basis, far fewer employees perform transactional activities and many more coordinate service delivery with BPO providers and internal clients. This means that most middle managers—many of whom rose in their positions because of their functional skills—must now learn better relationship skills. But changes in roles and mindsets ripple through all levels of the workforce, not just middle management. Efforts must be made to overcome the natural resistance to change, and at the same time to give people the knowledge and skills they need to work in new ways. In other words, managing change for the retained workforce—and for the provider workforce, as well—involves ensuring that the workforce can perform in the new ways required, and ensuring that they want to perform in those ways. Here are some keys to success along both those dimensions. Innovative programs for training, collaboration and knowledge sharing. Today’s innovative learning solutions can be especially powerful when it comes to enabling change. Performance simulations—learning environments that replicate the actual tasks to be performed by workers—help move people from knowledge to action. Web-based environments can provide training experiences that are both richer and more timely. Social learning and collaboration platforms offer access to real-time expertise and learning, and also provide a supportive environment that encourages understanding and change. Cultural assessments. These can help determine where misaligned attitudes and mindsets interfere with the workforce’s ability to succeed in the new work environment. Social media applications can help by enabling both clients and providers to take the pulse of a change program much more directly than by administering and analyzing an online survey. Redesigned work processes. Process reengineering is part of the transformation of the retained workforce, but helping the employees actually perform those new processes is just as essential. It is often important to use technologies that embed new ways of working into the applications used by the workforce. This goes beyond telling people about change and helps them perform in new ways. Ultimately, it is important to collaborate with leaders and members of the retained workforce as new structures and ways of working are designed and implemented. People are naturally more accepting of and engaged in changes to which they have had some input. The outsourcing operating model is a new world. But the transformation can be extremely positive when people are engaged from the start in the design of that new world, coexisting and prospering with an outsourcing partner. High-performance BPO arrangements are dynamic both in their goals and in how they are managed. They constantly seek to align their work with the wider needs and aspirations of the client’s business. Leaders from both client and provider find ways to leverage their management structures, processes and relationships to deal with this dynamism. According to our research, nearly 85 percent of high-performance BPO relationships proactively refine their objectives as the work proceeds, compared with just 40 percent of typical performers. This means that the most successful BPO relationships are attentive to managing the longer-term journey of change, often over the course of a multiyear contract. They also know how to manage multiple streams of work and multiple portfolios of change—a balancing act that is increasingly a characteristic of today’s business environment. At Microsoft, for example, which has successfully delivered a long-term, transformational outsourcing program in finance and accounting, the company and its supplier created a dedicated change management/portfolio management program to ensure the success of more than 200 events associated with the development of the outsourcing program. A combined client-provider team created global, functional and subsidiary-specific communication plans to engage with the various audiences affected by the change. Local leaders were assigned the responsibility of managing the readiness of Microsoft’s people, which signaled to the subsidiary that change was close to home. Assigning subsidiary leaders to the team also gave people within the subsidiaries confidence that one of their own—rather than someone flown in from headquarters—was providing input and direction to the solution. As this example suggests, it is important to bear in mind the difference between managing a short-term change program (such as the initial transition capabilities already discussed) and the longer-term journey of an outsourcing relationship. Because they are so collaborative at the core, high-performance BPO relationships often enjoy an advantage in this area. When the client involves the provider in strategic discussions, the two can work together to more effectively identify risks and avoid problems. Different stakeholders may have contrasting views of business drivers and all will face different pressures. It is important to reach consensus on approaches and to understand the exact nature of shared problems and challenges. Failure to achieve common resolve can put the overall BPO change journey off course downstream. Managing for the long term is also about managing opportunities, however, not just avoiding risks. This is another characteristic of effective BPO relationships. Both client and provider look for opportunities to broaden the impact of the arrangement. They work together to define a compelling vision for the future, identify where the gaps are and then create a longer-term roadmap to realize the opportunities. Putting processes in place to assess progress along the journey is also important. Of course, every outsourcing program has a project or program management office tasked with monitoring and reporting. However, as individual projects get rolled up into a larger portfolio of programs over the course of the BPO relationship, it becomes more challenging to track, measure and manage the integration points. A key to successful management, therefore, is moving beyond traditional project management so that multiple strands of work can be coordinated effectively. For example, an ongoing steering committee (which some call a “Journey Management Office”) can check the progress of multiple parts of the overall change portfolio as well as the impact each part has on the others. The Journey Management Office assesses the status of the journey against previously defined end-state targets and periodically reassesses those targets in light of market shifts and changing business priorities. It also monitors business outcomes, not just the achievement of intermediate project goals. This can keep the program on track through leadership shifts and marketplace change. Added up, these attitudes and behaviors create a BPO relationship that is more change capable—a more agile organization that recognizes change as a constant presence and actively seeks it out rather than avoiding it. The benefits of effective change management in BPO are measured at both an individual and organizational level. Companies that are attentive to transition issues and to supporting the retained workforce can drive topline benefits from a more effective functional organization—whether that is HR, finance, IT, procurement or something else. Then, that functional organization can continue to drive measurable improvements in business value, whether that is defined by sales, cost, productivity, retention or other significant metrics. It’s a little like that home audio system—which, if carefully installed and periodically updated as the technology evolves, will provide years of satisfaction. Accenture’s high-performance BPO research was based on a quantitative survey of 263 buyer executives, in-depth interviews, and input from more than 250 academic research studies. Many companies with world-class outsourced business services have radically redesigned their retained organizations. One common approach identified from our research is changing the retained organization from a “pyramid” to a “diamond” model. With a pyramid structure, most employees reside at the bottom of the pyramid. Such a structure is not without its benefits. For example, employees continually build valuable, client-specific experience as they are promoted higher up the pyramid. However, the cost of expertise in the pyramid model is high because it is applied only internally. By contrast, a provider can spread experts—and the cost of those experts—across multiple clients. 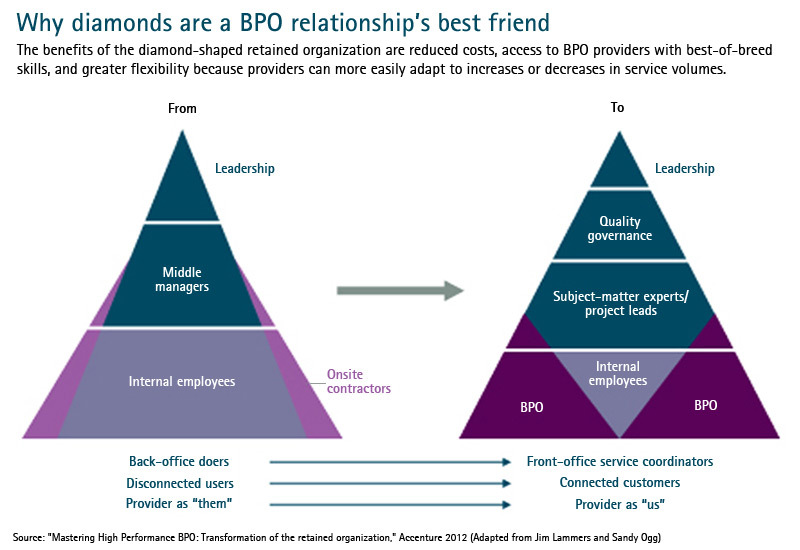 Diamond-shaped retained organizations replace the heavy bottom of the pyramid with BPO providers. Many transactional activities that were once performed by employees are now performed by providers, typically in a lower-cost location. There are fewer middle managers but more subject-matter experts and project leads. Michael J. Salvino is the group chief executive of Accenture’s Business Process Outsourcing growth platform. He is based in Charlotte, NC. Walter G. Gossage is the managing director responsible for change management offerings and capabilities within Accenture Talent & Organization. He is based in Dallas. Mary Lacity is Curators’ Professor of information systems at the University of Missouri-St. Louis.